The Jetson’s Vacuum Elevator has Arrived! Recently we attended the Hermosa Street Festival and were so intrigued with this ‘NewVac Lift’ booth! They featured a home elevator that creates a vacuum above the car. The air below the car lifts it up and a controlled release vacuum allows gravity to gently lower the car. This would solve so many homeowners problems. You don’t need the metal cables or a loud equipment room. Exterior Tube: The transparent tube is built around an aluminum structure. The tube walls are made of curved polycarbonate panels. The tube has modular sections, which easily fit into each other. 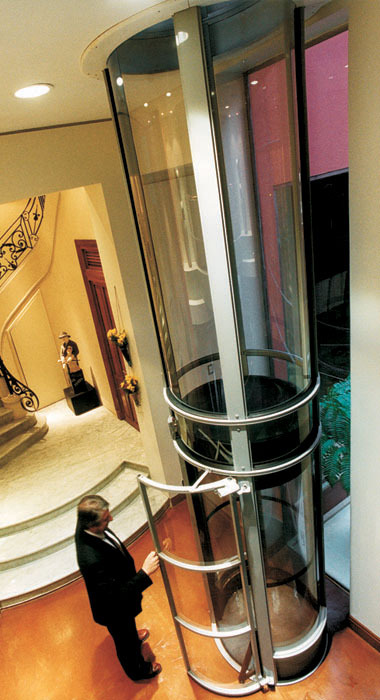 The tube is free-standing, self-supporting, and can stand on any ground floor. Elevator Car: The car runs inside the tube on rails/columns, which are part of the tube. The walls of the car are curved polycarbonate panels. The car has a mechanical anchoring system that activates on reaching the landing. The system provides precise but smooth stops, and locks the car at the landing. Control Unit: This 11″ x 37″ section above the tube houses turbines, valves, and controls. The control unit is placed either on top of the tube (standard), or in the attic (split unit) up to 30 feet from the lift. In the case of an electricity power failure as the descending car automatically stops and locks on the next floor. The principle operation of the pneumatic vacuum elevator is based on the ascending push generated by the difference between the atmospheric pressure on the top of the car and the atmospheric pressure under the car. The vacuum required to lift the car is powered by turbines operating as exhaust fans which are located at the top of the elevator, also known as the Suction Assembly or “Head Unit”.